The other day I stumbled across some dried blueberries at the grocery store. I was actually looking for dried cherries when I noticed this bright yellow package peeking out from behind an army of raisins. I reached for it and saw it was wild blueberries. Due to my need to have anything and everything blueberry, I quickly threw them in my cart, and the cherries were history. I know I’ve used dried blueberries before, but for the life of me I couldn’t remember what I used them in. I opened the blueberries to test out the situation and give myself a little refresher while I continued my shopping. To my surprise, the packaging was correct. They really did have an intense blueberry flavor, but they were very sweet. I also remembered I’ve used them in scones which work well, but I was in a cookie mood. All I could think was that I wanted to pair them with almonds to balance out the sweetness and add some different texture. I wanted to make a comfort cookie, but nothing too sweet. Right there in the front pocket of one of my recipe binders was my favorite oatmeal cookie recipe. That was it! A little revamping, partially due to new ingredients & partially due to butter stains smeared all over all the amounts, they turned out great. 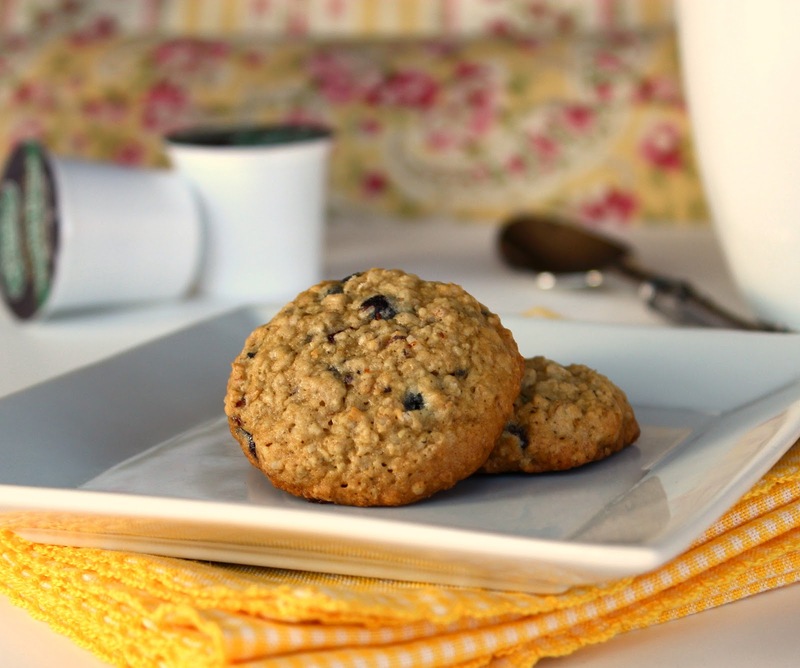 The blueberries give an unexpected pop of flavor adding something new to an oatmeal cookie. The almonds add another layer of flavor and offer a great texture to the soft, cake like cookie. The almond extract is key here, and the house smelled like a toasted almond ice cream pop when they baked! I also love how they baked. Golden with a slightly darker color just around the edges, and they puffed up like little pillows of goodness. Enjoy! Cream butter and sugars till light and fluffy. Mix in flour, salt, and baking soda. Mix in oats, almonds, and dried blueberries. Wrap cookie dough in plastic wrap & refrigerate a few hours – over night. Scoop cookies, I use a scoop that measures 1/2 ounce portions, and bake at 325 degrees for 13-15 minutes rotating once halfway through. I used a scoop that measures half ounce portions. I don’t roll or shape the dough. I just scoop it and bake. Make sure your cookies are chilled when they go in the oven. If dough is not chilled, cookies will bake flat. >These cookies look fantastic. My mom just gave me a bag of wild blueberries she bought at costco and I have been trying to decide what to make with them. These sound like the perfect fit. YUM! >Oatmeal cookies are my favorite. I have a recipe that uses fresh blueberries but dried are perfect for when it's not blueberry season. These are awesome! >These cookies look so delicious. I have a bag of dried blueberries in my pantry that I've been munching on for snacks. Better stop and save them for this recipe. Yummy! >I love dried blueberries and raspberries almost as much as dried cranberries, so I've always got some in the pantry. They're a great snack and perfect in granola! >Oh my goodness these look delicious. I love that they have blueberries in them. I must try to find some dried ones. I usually just zero in on the cherries and nothing else gets past the blinders. I need to expand my horizons apparently. >Perfect texture! Almond and oatmeal for the heartiness, blueberries for the fun sweetness! Brava! >Soo. Can I pretend these are ok for breakfast? Because all I can think about is having some with a cup of coffee. Yum! >My husband is crazy about this kind of cookies! Thank you very much. I will definitely give them a try! >Hi Buttercream Blondi, The cookies look delicious. Are the cookies crunchy or chewy? >The blueberry-almond combo is just divine! >These sound delicious! I love the combination of blueberry almond and it would be so heavenly in an oatmeal cookie! >I love these! I'm not a huge fan of raisins, so the blueberries would be a great sub for me! >Found a new companion to me morning tea. Oatmeal cookies are great and yours look delicious! >So distracting, those blueberries 🙂 These look and sound totally fantastic! >I love blueberries but have never ever put them in a cookie. Looks wonderful! >I love the sound of dried blueberries in a cookie! >Wow these cookies look awesome! I love dried blueberries too. >Love love love this recipe! I need to find some dried blueberries… when I made blueberry cookies we used frozen wild berries. I think the tried would be better! >Thanks girl! Hope you make them! >Thank you! I think I'm going to have to stock up on some for snacking too! >I agree Jen! Can't wait to use the dried blueberries in granola! >Definitely! In my book these are breakfast! >Thanks Eftychia! Hope you guys enjoy them! >Hi Candice! Thank you & these cookies are soft & chewy! >Yes they are! Thanks Sarah!